3 minutes You can only live about 3 minutes without air/breathing. 3 hours You can live only about 3 hours exposed and unprotected to extreme temperatures. Hyperthermia (body core rises to about 103F-106F, and usually is slower to kill). Hypothemia (body core declines to 87F-90F, can occur quickly if the body/clothing is wet freezing rain or submersion, then exposed to freezing or near freezing air temperatures). 3 days You can only live about 3 days without safe water. 3 weeks You can live only about 3 weeks without food. 3 months Death may follow without socialization after about 3 months. 1. A good rule of thumb for calorie intake is the same rule used by athletes when losing or maintaining weight; check your weight then multiply it by ten. (example, my weight 162 lbs. x 10 = 1,600 cal per day). If you weigh 200 pounds, this means you will need at least 2,000 calories just for your body to remain healthy in an inactive state. If constantly active (which is likely) you will need more than 2,000 calories to remain in good health. Never scoff at calorie counting, it may save your life. For home storage, I recommend at minimum, a one year supply of food. Stocking more, especially for trade, is preferable. 2. The second answer: You can never have too much food stored away for hard times. How much is the minimum for you is an answer you’ll have to come up with after reviewing your thoughts about the future. Will three days of food be enough, as many suggest? Or do you need a year’s worth? It is suggested that two weeks or more is the minimum for anyone in any potential survival situation. One to three months? Now you’re talking. A year? Let’s hope you never need it. A year may be excessive for most, but then, better safe than sorry. • It may take a while for store shelves to be replenished. Think back to the heavy storms that hit the East Coast in the winter of 1995. • 96. 30 inches in cities such as Washington, D.C., and Philadelphia shut the city down for more than a week. And the trucks carrying supplies were stranded on the side of an interstate highway somewhere in the Midwest. • You may be asked to feed friends or neighbors. Think how you’d feel if on the sixth day of the storm you and your family were enjoying a delicious, rich, beef stew while poor old Mrs. Frugal next door was down to a used tea bag and the bread crusts she usually gives the birds? Or what if friends were visiting for the weekend and unable to return home because of the inclement weather, earthquake or other emergency? • Food rarely goes down in price. What you buy now will be an investment in the future. If you shop carefully over time, you can lay in stores of goods on sale or at warehouse club prices. • You will be protected from price gouging. Do you really think the last load of milk and bread into the store before the storm hits will be discounted? Shelves are often cleared out right before a blizzard or hurricane is set to hit. And food isn’t the only item likely to be in short supply; one grocery chain reported that when storm warnings went out, they sold more rolls of toilet paper than there were people in the city. Batteries, bottled water, candles and other staples are also going to be in short supply. • You will be prepared for a crippling blow to our food supply system. As I write this, many are predicting our food supply is tottering on its last legs. Whether it’s a drought (like we saw in 1996 in Texas and Oklahoma), a wheat blight, the destruction of traditional honey bees necessary for crop fertilization or simply the world’s exploding population, they will tell you our food system is falling apart. The Utah State University Cooperative Extension recommends storing one pound of dry matter per person per day as part of a long term food storage plan. “Dry matter” consists of most food products you would store, including rice, legumes, dried milk, flour, pasta and sugar, among other items. One pound of dry matter will provide approximately 1,600 calories. The way your food supply is packaged will greatly affect the length of time it will remain a safe and viable energy source. For example, dried milk and freeze-dried fruits and vegetables should be stored in nitrogen packed cans for maximum preservation. Your entire food supply should be stored in a cool, dark and dry environment in secure packaging to prevent spoilage and pest infestation. Remember, 1 pound dry food contain about 1600 calories= 1 lb/person/day. Food not only nourishes our bodies, but can also nourish our mood and spirits. Therefore, it’s important to include flavors and foods that are familiar so they can provide a source of morale and comfort during stressful or emergency situations. Most cooking oils, spices and seasonings will last several years if stored properly. Dried coffee, tea and cocoa will also have extensive shelf lives when kept well. In addition to food and water, you’ll also need supplies and tools to be able to prepare and serve meals. Don’t forget to include pots, pans, utensils, a can opener, a grain mill, plates, bowls, glasses and a some sort of cooking implement such as a grill or camp stove. Fuel for your cooking implement will also need to be readily available or stored. Vitamin and mineral supplements will ensure that each person will receive proper nutrition, particularly if part of your food supply becomes contaminated and unusable. Lastly, be sure to store food and additional water for family pets. 1. Build up your everyday stock of canned goods until you have a two-week to one-month surplus. Rotate it periodically to maintain a supply of common foods that will not require special preparation, water or cooking. 2. Buy a supply of the bulk staples listed above. 3. From a camping equipment store or on-line business, buy commercially packaged, freeze-dried or dehydrated foods. Although costly, this will be your best form of stored meat– buy accordingly. Remember the ditty: ‘A case if you can, a can if you can’t.’ Buy long term nitrogen packed foods by the ‘case’ if you can afford them, or stock up with canned goods if you can’t. Analysis of historical data from selected US cities during the 1918 pandemic suggests that duration of implementation of non-pharmaceutical interventions are associated with mortality rates. Pandemic waves may average about 6-8 weeks; however, an extended wave may occur; communities should be prepared to sustain themselves for up to 12 weeks in a Category 4 or 5 pandemic. Previously, Federal guidance called for three days of food and water for emergency situations. In response to pandemic flu, two weeks of food is probably the minimum for anyone in any potential survival situation. A stockpile of one to three months is probably a more realistic inventory for prolonged social distancing in response to pandemic flu. A year? Let’s hope you never need it. A year may be excessive for almost any purposes. This food reserve should not include food in your refrigerator or freezer, because you cannot count on those items remaining edible for more than a day (fridge) or three (freezer), at most. You can survive over a week without food, but only 3 days without water. Roughly 70% of the adult human body is made up of water. FEMA suggests storing at least one gallon of water per person per day. A normally active person needs at least one-half gallon of water daily just for drinking. A two-week supply of water would be sufficient to deal with a worst case scenario in which there was a temporary interruption of the municipal water supply. Otherwise, tap water is safe to drink and poses no risk of transmission of flu virus. a) According to the Food and Drug Administration (FDA), food can be safe forever from a food borne-illness standpoint – but if shelf-stable food has been on the shelf for an extended period of time, you might not want to eat it because the quality may not be good. In this case, the “best if used by” date on the label of the product is an indication whether or not the quality of the food is good. b) Food quality deals with the taste, texture, and nutritional value of food. “Shelf-life” is the length of time food will retain most of its nutrition and flavor. Food that may still be safe to eat may have lost much of its nutrition, if stored past its shelf life. Things that cause food to go bad are moisture, oxygen, insects, and animals getting into the food. c) Cans of food from the super market make good storage foods, but you should use the oldest ones first and replace them. This is called “rotating” your food. The easiest way to do this is to put the date that you bought the food on the top of the can with a magic marker. This makes it easy to use the oldest first. Canned foods will keep for at least one year, if kept in a cool, dry place and not allowed to freeze. d) Some foods, such as canned foods, have a product code stamped on the bottom or top of each container providing information such as “best quality date” or “use by date,” the name of the plant where the food was manufactured, and the lot number. The code number may not be consistent from one manufacturer to another. For instance, food manufacturers may indicate the “use by date” as month and year (APR00) stamped on top of the can. APR00 means the food should be consumed by April of 2000. The first letter and number (corresponding to month and year) of the stamped code also may indicate “use by dates. e) When in doubt throw it out! Never taste food to determine its safety! Check canned goods to see whether any are sticky on the outside. This may indicate a leak. You will have to evaluate each item separately. Food may be spoiled without a detectable off-odor. f) Food that is temperature abused will spoil rapidly as evidenced by off-odors, off-flavors, off-color, and/or soft texture. g) Dried fruits have a long shelf-life because moisture has been removed from the product. Unopened dried fruits may be stored for 6 months at room temperature. h) Canned vegetables can be stored in a cool, dry area below 85°F (optimum 50°F to 70°F) for up to one year. After one year, canned vegetables may still be consumed. However, overall quality and nutritional value may have diminished. Discard badly dented, swollen, and/or rusty cans. i) Dry milk may be stored at cool temperatures (50°F to 60°F) in airtight containers for one year. Opened containers of dry milk, especially whole milk products, should be stored at cold temperatures to reduce off-flavors. Reconstituted milk should be handled like fluid milk and stored at refrigeration temperatures if not immediately used. j) Canned evaporated milk and sweetened condensed milk may be stored at room temperature for 12 to 23 months. Opened canned milk should be refrigerated and consumed within 8 to 20 days. k) Rice Dream is rice milk in boxes, similar to juice box packaging. They come in 8 ounce, 32 ounce and 64 ounce sizes. It tastes great with cereal, and for use in cream based soups. You can even fix yourself of chocolate milk using Rice Dream. Rice Dream has a long shelf life, generally the date stamped is one year ahead from the day you purchase it. However once you open it, it needs to be refrigerated and it tastes freshest if used within 4 or 5 days. The manufacturer says it will stay fresh in the refrigerator for 7 – 10 days, however the 5 day mark is the longest period time it retains its full freshness. l) Commercial bottled water has an extended shelf-life of one to two years due to extensive water treatment (filtration, demineralization, and ozonation) and strict environmental controls during manufacturing and packaging. Bottled water should be stored in a cool, dry place in the absence of sunlight. Household tap water has a limited shelf-life of only a few days due to the growth of microorganisms during storage. Grains, beans and rice, cornmeal, baking soda, legumes, salt, honey, sugar, flour, yeast, pasta, dehydrated dairy products and eggs. Bulk staples offer a limited menu, but you can supplement them with commercially packed air-dried or freeze-dried foods and supermarket goods. Rice, popcorn and varieties of beans are nutritious and long-lasting. The more supplements you include, the more expensive your stockpile will be. A half a cup of dried rice, a little less than half a pound, is equal to roughly 1½ cups of cooked rice. That is a lot of rice per person, so no one should be very hungry. Rice and beans twice a day for a month will provide almost all the nutrients a body needs. The question is, “How much beans are needed?” Figure one half of a 15-16 oz can of beans/ person per day. (1 can/2 people/day) It’ll keep you alive, but you won’t thrive. If you get dried beans, figure ¾ cup dried volume per meal, or 22 cups/month (1 gallon=16 cups), hence, a 5 gallon container would hold a volume of dry beans to feed one person 3-1/2 months. The drawback to dried beans is that they have to be soaked for 24 hours, so you will have to start soaking beans 24 hours in advance of each meal which is a pain. • 1 person on a 100% rice diet would need 350 lbs rice per year, 5 each 5 gallon buckets filled with dry rice). • On a 1/2 rice and 1/2 bean diet one would require an annual supply of 175 lbs rice (2-1/2 each 5 gal buckets) per person. Same volumes for combinations of rice, dry beans, legumes and peas. • 2 persons 700 lbs rice or 10 each 5 gallon buckets, at half fare 350 lbs or 5 each 5 gallon buckets. Same volumes for combinations of rice, dry beans, legumes and peas. For each volume of dry rice you should have a similar volume of a combination of beans, legumes or peas; a 1 gallon volume of dry rice goes with a 1 gallon volume of dried beans. • Equivalents: For most beans: 1 pound dried beans = 2 cups dried, which yields 4 to 5 cups cooked beans. • 1 lb dry beans/peas=5 cups cooked=5 days food as a rice accompaniment. • 6 lbs dry beans/peas=1 month supply/ person as rice accompaniment. • Long grain white rice value bucket, 47 lbs, packaged in a 6 gallon sealed plastic storage bucket, containing 384 each ¼ cup servings, with a 20 to 30 year shelf life, $92.49. • Bean Sampler case of 6 each #10 (gallon size) cans with: 2 cans pinto beans, and one each kidney beans, navy beans, black beans, refried beans, $88.25. The best way to store food for the long-term is by using a multi-barrier system. This system protects the food from natural elements such as moisture and sunlight, as well as from insect infestations. Typically, those who store bulk foods look for inexpensive items that have multi-purposes and will last the long term. Listed below are 11 food items that are not only multi-purpose preps, but they can last a lifetime! • Honey: Honey never really goes bad. In a tomb in Egypt 3,000 years ago, honey was found and was still edible. If there are temperature fluctuations and sunlight, then the consistency and color can change. Many honey harvesters say that when honey crystallizes, then it can be re-heated and used just like fresh honey. Because of honey’s low water content, microorganisms do not like the environment. • Salt: Although salt is prone to absorbing moisture, it’s shelf life is indefinite. This indispensable mineral will be a valuable commodity in a long-term disaster and will be an essential bartering item. • Sugar: Life would be so boring without sugar. Much like salt, sugar is also prone to absorbing moisture, but this problem can be eradicated by adding some rice granules into the storage container. • Wheat: Wheat is a major part of the diet for over 1/3 of the world. This popular staple supplies 20% of daily calories to a majority of the world population. Besides being a high carbohydrate food, wheat contains valuable protein, minerals, and vita¬mins. Wheat protein, when balanced by other foods that supply certain amino acids such as lysine, is an efficient source of protein. • Dried corn: Essentially, dried corn can be substituted for any recipe that calls for fresh corn. Our ancestors began drying corn because of it’s short lived season. To extend the shelf life of corn, it has to be preserved by drying it out so it can be used later in the year. • Baking soda: This multi-purpose prep is a must have for long-term storage. • Instant coffee, tea, and cocoa: Adding these to your long-term storage will not only add a variety to just drinking water, but will also lift morale. Instant coffee is high vacuum freeze-dried. So, as long as it is not introduced to moisture, then it will last. Storage life for all teas and cocoas can be extended by using desiccant packets or oxygen absorbing packets, and by repackaging the items with a vacuum sealing. • Non-carbonated soft drinks: Although many of us prefer carbonated beverages, over time the sugars break down and the drink flavor is altered. Non-carbonated beverages stand a longer test of time. And, as long as the bottles are stored in optimum conditions, they will last. Non-carbonated beverages include: vitamin water, Gatorade, juices, bottled water. • White rice: White rice is a major staple item that preppers like to put away because it’s a great source for calories, cheap and has a long shelf life. If properly stored this popular food staple can last 30 years or more. • Bouillon products: Because bouillon products contain large amounts of salt, the product is preserved. However, over time, the taste of the bouillon could be altered. If storing bouillon cubes, it would be best repackage them using a food sealer or sealed in mylar bags. • Powdered milk – in nitrogen packed cans: Powdered milk can last indefinitely, however, it is advised to prolong it’s shelf life by either repackaging it for longer term storage, or placing it in the freezer. If the powdered milk develops an odor or has turned a yellowish tint, it’s time to discard. The main difference between commercially prepared foods sold in grocery stores and specially prepared “survival” foods is the shelf storage. You can’t store grocery store items for five to ten years, as you can with specially freeze-dried or sealed foods packed in nitrogen or vacuum sealed. As a result, if you go with a larder full of grocery items, you can’t develop your food stash and walk away. You need to rotate your stock, either on an ongoing basis or every two to three months. This will ensure you have fresh food (if you can consider canned and dry food “fresh”) and do not waste your food and money. Advantages of canned vs dehydrated foods: Canned goods are less expensive – Canned goods bought in bulk are roughly, pound-per-pound of finished product, about 25% of the cost of the same product offered in freeze-dried or dehydrated form. Canned foods seem to take up a little more storage area. That’s a small sacrifice when you think about the amount of money you’ll be saving. Canned goods generally have more calories – It’s difficult to make a direct caloric comparison between freeze-dried/dehydrated foods and canned foods, but it is generally true that canned goods contain more calories in the form of fats than freeze-dried foods. Published food values support this contention. Canned goods already have water for preparation in the can. Freeze-dried/dehydrated foods have no water content. This means that on top of the drinking water you’ll need to store, you will have to store extra water for your food preparation if you have freeze-dried or dehydrated foods. Other advantages – Canned foods have a good shelf life, they’re available at virtually every market, and you are already familiar with the preparation since these are foods you frequently eat. Meals Ready to Eat: Certain items such as MRE’s are excellent for emergency situations, because they come out of the package ready to eat, with no cooking needed. MREs do not provide as much roughage as you need, which can lead to digestive problems after a week or two of eating nothing else. MRE entrees are excellent supplements, because prepared sets of #10 cans are primarily vegetables, pasta and grains, while MRE entrees are usually meat-based. You may also want to add a few special items, such as hard candy or deserts, to reward yourself or for quick energy. And don’t forget to add vitamins and mineral supplements. Taste: Dehydrated foods are without any seasoning or additional ingredients. Dehydrated foods require cooking and seasoning. Most dehydrated foods will benefit from added seasons. You can add any ingredients or topping to dehydrated foods. Seasoning is recommended simply for taste. Most freeze-dried foods are contain a multitude of ingredients and seasonings. Nothing more is needed, just a little time in hot water to rehydrated them and have them ready to eat. They are pre-seasoned, pre-cooked and pre-mixed with other ingredients, making them the fastest, easiest and tastiest foods available. Cooking: Cooking is very simple. Measure out the amount of ingredients you wish to make (depending on the number of servings you want) and dump into hot water. Cooking time is usually around 10 – 15 minutes for most foods. This applies to all the Mountain House freeze-dried foods. Ingredients: Freeze dried food is usually an “entree”, containing multiple items for a complete meal. Most dishes have several items included within them and you don’t need to do any other cooking or adding ingredients to make a complete meal. Because it’s freeze-dried, you simply add hot water, or add the product to hot water and cook for about 10 minutes. This rehydrates the food completely and it’s ready to eat! Dehydrated foods are usually single ingredients. You can mix any dehydrated food with any other food product for a combination of tastes, textures and varieties. Freeze dried food are the easiest and tastiest food made for long-term storage. If you don’t like to cook and want great food with a great taste, freeze-dried foods are the hands down winner. Shelf Life: Freeze dried foods advertise a 25 year shelf life. Store your food storage in a cold (or cool) dark place out of direct sunlight, preferably at a constant temperature. Dehydrated foods in #10 cans will store about the same length of time. Space Requirements: Storable foods, whether freeze-dried or dehydrated foods, are very compact, way more compact then canned foods. There is no excess water or fancy packaging, no empty air spaces. An entire years supply can be fit into a 2 ft x 3 ft area, stacked 5 ft high. Or under the bed, in a closet, in the pantry, in the basement. These foods are concentrated, because the water has been removed before packaging. A single can contains 8 to 16 servings. With Mountain House freeze dried products and a one-burner stove, or candle to heat water (cold water can be used in a pinch), you can still enjoy a hot, satisfying meal in less than 10 minutes. Just-In-Case: The complete 7-Day food supply for one person, in one box Mountain House Brand quality freeze-dried foods. • 28 Mountain House freeze-dried food pouches. 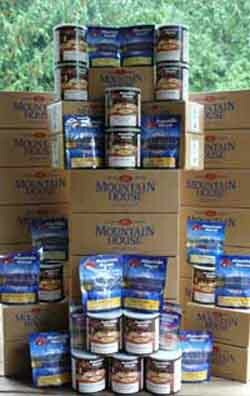 • 17 kinds of Mountain House freeze-dried foods in the kit. • Three full meals per day, in easy-to-serve pouches. • Breakfast, lunch, and dinner items in the same box. • Freeze-dried flavor & nutrition in foil pouches with a 5-year storage! • No cooking required. Just add water, and presto! These one-week supply kits are Freeze Dried, and that means that an entire week’s food supply weighs only 9 pounds! The #10 Cans (gallon size) of freeze-dried foods have the longest shelf life available up to 25 years! Each can is coated with a protective enamel inside and out for double protection, including the lid. The can’s contents are protected until you are ready to open and use them. After opening, use the contents with a week for best results and taste; using the convenient resealable plastic lid between uses. Treat any leftover food as you would fresh food. Mountain House freeze-dried foods are packed in airtight NITROGEN PACKED #10 cans or pouches. Up to 98% of the residual oxygen has been removed. The unique Mountain House canning process uses both vacuum oxygen removal and nitrogen flushing. 1. Stocking up made simple: Buy what you can afford. Buy the kinds of foods or entrees that you’re familiar with. • Buy foods on special, from warehouse stores, feed and grain supply stores, name brand packages from on-line distributors. • Organize your buying for 3-month increments. The following survival food list will help determine what to have on hand in the event of a widespread disaster or upheaval. The easiest way to get these foods is to order pre-measured long-term storage food. This food will be packaged based on the amount of people that need to eat. After Pharaoh had heard Joseph’s reply, he began to tell him about his dreams: “In my dream I was standing on the bank of the Nile, when out of the river there came up seven cows, fat and sleek, and they grazed among the reeds. After them, seven other cows came up — scrawny and very ugly and lean. “I had never seen such ugly cows in all the land of Egypt. The lean ugly cows ate up the seven fat cows that came up first. But even after they had ate them, no one could tell that they had done so; so they looked just as ugly as before. Then I woke up. After Joseph had heard about the dreams, he gives his interpretation: “The dreams of Pharaoh are one and the same. God has revealed to Pharaoh what he is about to do. The seven good cows are seven years, and the seven good heads of grain are seven years; it is one and the same dream. “The seven lean, ugly cows that came up afterward are seven years, and so are the seven worthless heads of grain scorched by the east wind: They are seven years of famine. It is just as I said to Pharaoh: God has shown Pharaoh what He is about do. Seven years of great abundance are coming throughout the land of Egypt, but seven years of famine will follow them. “Then all the abundance in Egypt will be forgotten, and the famine will ravage the land. The abundance in the land will not be remembered, because the famine that follows it will be so severe. Product and cost examples of freeze dried, long term emergency foods in nitrogen packed, #10 cans. Imagine what a life saver these foods will be when your electric power is knocked out for several days by a severe storm. With Mountain House on hand and a one burner stove or candle to heat water (cold water can be used in a pinch), you can enjoy a hot delicious gourmet tasting meal in less that 10 minutes. Having your own private food reserve makes a lot of sense–now more than ever before. The peace-of-mind and security that comes from having your food reserve is potentially priceless! Could you survive a food shortage? If food supplies were interrupted for any variety of reasons ( i.e. crashes of grocery store computers or computerized delivery systems, a natural disaster, civil unrest riots, trucker strike, etc. ), existing store supplies would disappear within hours. No amount of money in the bank could put food on your table…for sure not the kind you enjoy today. And how about those credit cards and ATM cards–if the power is out or computer lines are down you’ll be on your own. This does not need to ever happen to you or your family. All you need to do is simply take a few prudent steps today and get prepared with your own food reserves. #10 cans have a volume of 1 gallon. – Oriental Spicy Chicken, $35.29. – Raspberry Crumble, $23.59 Out of stock..
‘Ultimate’ Year Supply of Food Storage in #10 CANS. If you’re going to prepare for an emergency, you might as well do it right. And there is no better way to stock up on your food storage than by ordering The Ready Store’s Ultimate Year Supply of Freeze-Dried Food. This product has every essential that you will need to fulfill all your nutrition needs during a disaster. If you want a 100% complete year’s worth of gourmet-tasting foods, then you’re going to want the full 3 meals per day as well as the vegetables, fruits, breakfast foods, and other goods this package has to offer! Not only does it have some of every main course entrée available, but this Ultimate Year Supply is also composed of the best food freeze-drying technology can make. This means that you won’t have to waste time cooking when you could be doing more important things during a disaster. Freeze-dried foods also mean that your food storage will remain fresh up to 30 years, giving you peace of mind and real, tangible security. Since this is the longest lasting of all our year-supply packages, you and your family can enjoy knowing that you are ready for whatever life could throw at you. And since all 144 #10 cans are packed into 24 easy-to-store cases, you won’t have to worry about not having enough room to store them all the time. Occasionally Items may be substituted with similar items of equal or greater value due to availability. Calorie and serving count may vary plus or minus 5% depending on substituted items. Storage Requirements: To achieve maximum shelf life, store in an environment with a temperature of 60°F or lower and humidity of 10% or less. Shelf life statements are based on industry standards and relevant studies from reliable sources. The Ready Store disclaims any liability or warranty as actual shelf life results may vary depending on individual storage conditions.